Welcome to an experience at Moroccan House that will unveil the age-old mystery of moulding diversity into a harmonious unity. In this world of quick-fix food, Moroccan cuisine is the total opposite, unrushed and honest, it allows the karma of souls to meet and create true harmony. 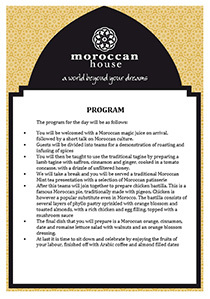 In our team building experiences we spend the day exploring the mysteries of Moroccan food. Moroccan food has been enriched for over two thousand years by its surrounding cultures, to become a mixture of sweet, salty and earthy spice flavours creating the rich cuisine that it is today. Morocco is the gateway between Africa and Europe. The cuisine itself is a blend of the traditional and the colonial, with influences from all over the world. Rich spices distinguish Moroccan cooking. Saffron, coriander, cinnamon, cumin, ginger and paprika come together in various proportions to create fabulous combinations. Minimum 10 people, maximum 16 people. The cost of R 750.00 per person includes the cooking experience and the lunch but excludes any additional drinks.